One of China’s leading female players, Ju Wenjun has many different accomplishments within a short amount of time. She is a star in China who has played in two different Women’s World Chess Championship tournaments and placed high in the Dubai Open. Despite some issues with confirming her official Grandmaster norms, she is sure to get them settled and achieve the full Grandmaster title very soon, while also continuing to rise to the top of the female chess world. Ju Wenjun’s first chess success was in 2004 when she came in second place in the Asian Women’s Chess Championship. Later she played in the Women’s World Chess Championship tournament in 2008 and 2010, being knocked out of the tournament both times before the final round. 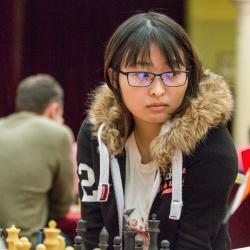 Ju Wenjun became a Woman Grandmaster in 2009 and in 2010 she won the Women’s Chinese Championship. During January 2011 she was the third best female player under 20 years old. In 2011 there was a discrepancy regarding one of her Grandmaster norms and she has to yet to achieve the full, official Grandmaster title. Since then she has achieved her highest rating ever in January 2012 when she was 2552. In April 2013 she also placed second at the Dubai Open with a 2683 rating performance.